Dental kits comprise of disposable toothbrush and tooth paste. This is probably one of the most desirable guest give away’s. How many people do you know that have gone on holiday and forgotten their tooth brush or toothpaste? And late at night you have little chance of finding a shop open that sells tooth brushes or tooth paste. Many hospitality providers offer these in their rooms as standard however others offer them as a separate service only available to guest that ask (with the service being noted in the room folder). 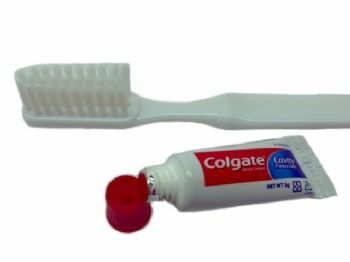 Whish ever way you offer the service you need to offer your guest these disposable tooth brush and toothpaste kits. Colgate tooth paste is used as brand awareness is key to offering even more comfort in a time of great stress. There is more than enough toothpaste in the tube for at least two uses. The disposable toothbrush is made from white plastic and bristles and is individually cellophane wrapped for hygienic storage and handling.